#‎I’d really love to be close to people I love but I can’t begin to think of what it might deprive me of. I am the type who would leave a room unannounced, withdraw from a crowd and even say nothing sometimes when spoken to. How many people can tolerate this? They’re only going to judge me, thinking my attitude is about them. It’s not! It’s about me. You are a great person but I really value time to do things I’d love to do alone. If it was about you, I’d have told you. I am not fighting any demon. I just feel the need to dream and as much as I would like you to be part of the experience, I don’t want to hold you down. I gave a dude I met my phone number and now I feel uncomfortable answering his calls. So tell me, if it were you? How will you deal with this situation. #feel free to drop your comments on it#. Post Credit: Christian Ariel Maximilian.. Previous article Ask me anything.. 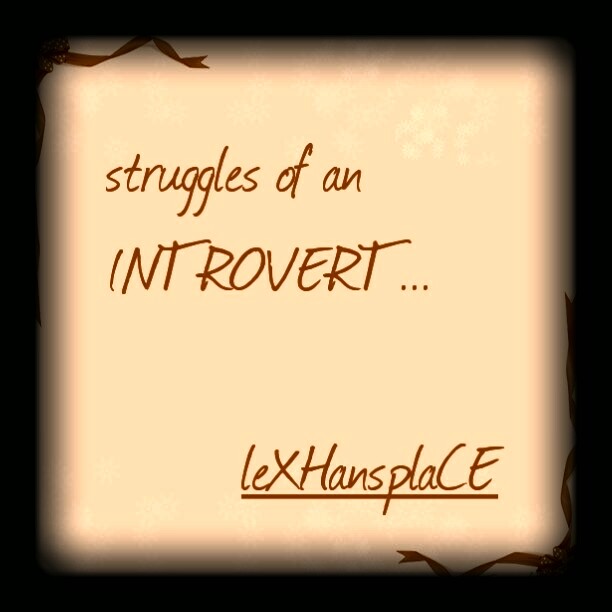 I'd really love to know how introverts can deal with their introspective nature. I have no suggestion myself. Hopefully we get solutions from people's comments… and also.. thankx for the post.. I was very shy as a child and young adult. Still have my moments. This was a great read. Am glad it was useful to you candace.. Most def. But some still can't just live the zone.. hope they read this. great point of view, if you dont want to talk to someone means u are not comfortable, so go ahead and someone is looking forward for you. Mine wasn't a chronic one, but i work on my confidence. It helped me. Great one there gloria, working on it is a good idea as you alone can solve it. Short, but meaningful post! Being an introvert sure is difficult… Talking from experience. yes it sure is a difficult thing mei.. am glad you shared this from experience. I think that if you allow people to initially know you, then they will be okay and understanding of your introverted nature. allowing people know you is a good idea also but not everyone is worth the chance of knowing us all you know. Bolatito just said it all in a shelled set of words, no need for explanations.. I can definitely relate as I was this way IN high school! My reason and excuse was that I didn't like to be around people. It wasn't them, but me. I felt more comfortable by myself doing my own thing and it took me a REALLY long time to come out of my shell and send a wrecking ball to the wall. i really liked your post. As many persons i am this kind of person who loves to have her moment af doing nothing or being left alone to do what she wants. I have these kind of moments when i wish i go alone in a chalet on a mountain. truly going in a chalet on a mountain shows the fact that its those kind of moments we just want to be left alone but we come back to mingle… tnx for stopping by. I'm naturally more of an extrovert, but I can't really help. I do find it fascinating sometimes to get into the mind of introverts. A lot of my friends are and I know how hard it can be and I try never to be the annoying outgoing person to tell them to "snap out of it". It's who they are!!! All that matters is that you do things you feel comfortable doing, at your own speed, and the right people will understand. Maybe this guy secretly feels the same, who knows? You just have to put yourself out there. Make the effort to just talk to one person. The more you do it, the easier it will be for you. Well said, Roy. This is exactly how I try to overcome it. Its a daily struggle. I can definitely relate to this. I am an introvert and I experience the struggles that people like me go through each day — the fearof huge crowds, speaking in public, presentations, talking to people — the list is endless! Everyday is a battle to relate to people as "normally" as I can. I can so relate. I love me and the way I am but I also hate what it does to people. People just misunderstand and take it personal. Lost a relationship over it too. I love being by myself, can't help it. I hope I find someone who understands it's not about them. good one there Ife, sorry about the relationship you lost that way… just remember you can only be you. "I did return his call , though, after I had rehearsed what to say to him and also how to end the conversation quickly while not sounding like someone in a haste to hang up." Lisa you just said my mind on this also… so true . It's very common to find a history of unresolved loss, grief or trauma at the core of challenges like these. yes, yet alot of people will not understand it that way but will rather find faults in the person in question, thankx for this contribution.. I was EXTREMELY shy as a child. It wasn't until I came to accept that I am shy by nature that I was able to sort of overcome it. My mom always made it out to seem like it was a bad thing because she is the complete opposite of shy. Now, I just sort of own it and let people know up front that I am shy, but I'll come around once I get to know them better. I'm an introvert, and do avoid answering calls if possible, but only because I hate awkward silences and small talk. I can be with people, but most of those who know me understand if I quietly excuse myself. I try not to let my 'introvert-ness' be an excuse for APPEARING rude – it's a struggle sometimes, I understand. And though I am an introvert, I'm not shy. Amanda you somehow seem to be the female version of me… same thing here though… i like the part were you dont want people to see the introvertness as an excuse for appearing rud… thanks for stopping by. I'm super awkward and an introvert too. I hate leaving a party and having to do goodbyes. I would rather slip out unnoticed too. I can't, especially with kids, everyone wants goodbyes. But it can be hard. Thank you so much for sharing this over at #bloggerspotlight link and Pin-it Party. I do appreciate it and hope to see you again! Pinned! As an introvert, tell yourself you are as good as anyone who is confident. You only have to believe and act it. Who says confident people don't have jitters? They just hide it best. Lol, so true Stella, they truly do. I am very much an introvert. I always have been and it used to really impede on my daily life, I was constantly anxious and hiding. Now I am still reserved and quiet but i'm not scared anymore. Am glad you are not scared anymore… keep being you. I am an introvert also and extroverts will never understand what it's like. I am social as much as I can stand to be and then I need alone time to recharge. I came across a t-shirt that cracked me up: INTROVERTS UNITE! We're here, we're uncomfortable and we want to go home! The t-shirt though… we all need that recharge time you know. I can understand your point. Hello, thank you for sharing your friend's post with us. I am an introvert myself, so I feel for her. I absolutely hate making phone calls. I always have. But, having phone conversations with my boyfriends wasn't something I was going to deprive myself of. If you're compatible with someone, you'll be able able to find things to talk about, which will put your mind at ease. But, it definitely doesn't hurt to be upfront with them and tell them how you feel. If they truly like you, they will accept you for you.